There’s a lot going on in the first season finale of AMC’s The Walking Dead. The sixth episode “TS-19” opens back in the hospital where Rick is still laying in a coma. Shane had come to rescue him, but hell was breaking apart around them. When soldiers rally up hospital staff and patients only to execute them before getting overtaken by walkers themselves, Shane has no reason to think Rick is alive and barely makes it out himself. But the jump back to the present finds Rick reunited with his family in the luxury of a nearly abandoned CDC stronghold. For most of the episode, the zombies are an exterior threat they can forget for the moment. Jenner gives a cautious welcome and then treats the survivors to feast. It’s a rare moment of joviality with wine and a little Southern Comfort flowing. Of course, Shane kills the mood probing for the harsh reality that left Jenner as the only CDC doctor remaining. Still, a rec room, hot showers and a secure place to sleep offer a respite from months of danger. Not everyone can embrace their time of R&R, though, as Andrea is sent reeling from the realization that all civilization has fallen and a drunk Shane still hasn’t recovered from losing Rick’s wife Lori when Rick returned. But any sympathy he garners from an impassioned plea about thinking Rick was dead evaporates when he tries to force himself on her. Only fingernails across his face stop him. “We don’t have to be afraid anymore,” Rick tells Lori. “We’re safe here.” But the promise of safety is quickly broken. After a scientific explanation of what’s happening to the walkers, through images of Test Subject 19—though Dr. Jenner still doesn’t know if the cause is “microbial, viral, parasitic, fungal” “or the wrath of God”—Dale notices a countdown clock with 11 hours left on it. It’s the countdown to power failure when the CDC self-destructs. Jenner, who was planning on killing himself before the survivors arrived, has locked everyone inside, trying to spare them a brutal death outside by delivering an instant one inside. TS-19 was his wife, and a month alone hasn’t led to great mental stability. Rick, who introduced himself in Episode 1 as someone who didn’t express his feelings has to use his persuasive skills again to convince Jenner to let them all go. But not everyone decides to escape back into zombieland. Andrea and Jacqui choose incineration until Dale tells Andrea that he’s joining her either way. Dale and Andrea get out just before the CDC explodes. They all have to get past a scattering of walkers before they’re safe, but like most of the episodes that came before it, the finale was less about the attack of the zombies and more about the space between zombie encounters. It’s a fitting end to a short first season that’s been more about what to do with survival rather than how to survive. Some of the group can’t even get past the the question of why they should even try. But for most, those moments in between zombie attacks are worth fighting for—the laughter, a decent meal and people you care about to share it with. And after six episodes, the characters are worth caring about. Despite occasional stilted monologues, quick tempers and unfortunate stereotypes, the few living souls in The Walking Dead are a bigger draw than the undead. The show has spent more time on topics like marriage, parenthood, unfaithfulness, loss, domestic violence, gender roles, small-scale politics, loyalty, kindness than it has with kill shots. By filling the world with zombies, Frank Darabont is able to explore the human condition under extreme circumstances. • The scientific explanation is generic but fairly satisfactory—the disease restarts the brain stem, leaving the rest of the brain dark, reducing victims to instinct. • Dale is becoming the most interesting character of the bunch. His decision to stay with Andrea doesn’t seem forced, and he seems freaked out enough by the impending doom to make it seem real. 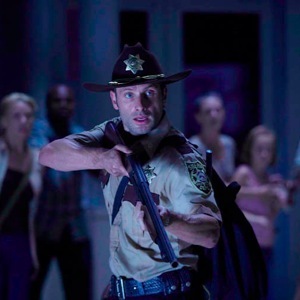 • Each episode has ended with an intense action scene, but the finale just ended with a literal bang—everyone just ran out of the building before it went boom, with just a few token head-shots of walkers on the way to the caravan. • The show ends with “Tomorrow Is a Long Time” by Bob Dylan. There’s not a lot of music in The Walking Dead, but this was a good one. • Season 2 isn’t coming until Fall 2011.